Haunting imagery from "a night to remember" 100 years ago next month was revisited through the stories of family members and friends of passengers who were aboard the ill-fated ocean liner RMS Titanic when it sank in the frigid waters of the north Atlantic. Those gathered in the Memorial Room of the Fairfield Public Library on Monday night could almost hear the Rev. Thomas Byles reciting the Lord's Prayer on the deck of the Titanic as his great nephew Geoffrey Morris, editor-in-chief of Fairfield Magazine, talked about the Catholic priest's heroic efforts to calm the doomed passengers and his selflessness in refusing refuge in several lifeboats. They could almost feel themselves shivering in the penetrating cold air as Rich Santalesa of Fairfield recounted stories he heard firsthand from his grandfather about his experiences aboard the Steamship Carpathia, the Titanic's primary rescue ship and the first vessel to reach the disaster site. And they gained a measure of hope when they learned from Sandy Clarkson of Fairfield that there are sometimes miracles amid horrific tragedy. Clarkson, who identified himself as someone who "enjoys history and whenever I can touch it," said he and his wife befriended the youngest survivor of the Titanic disaster in the last 12 years of her long life, which ended in 2009 at the age of 97. She was the last of the ship's survivors. Millvina Dean was only nine weeks old when her parents and brother boarded Titanic in Southampton, England. Her father perished after the "unsinkable" liner sank from damage caused when it struck an iceberg, but she was spared when the rest of her family board lifeboat No. 13 and she was bundled in a postal sack for warmth. "What began as a letter requesting an autograph turned into a friendship of 12 years," said Clarkson, who brought to the library a scale model of the Titanic signed by Dean and carrying a piece of coal from the ship. The model will be on display for the remainder of Fairfield's "One Book, One Town" community reading program. The voices of the Titanic were presented to the audience of about two dozen people in a panel discussion, one of numerous offerings in the library's annual One Book, One Town initiative. 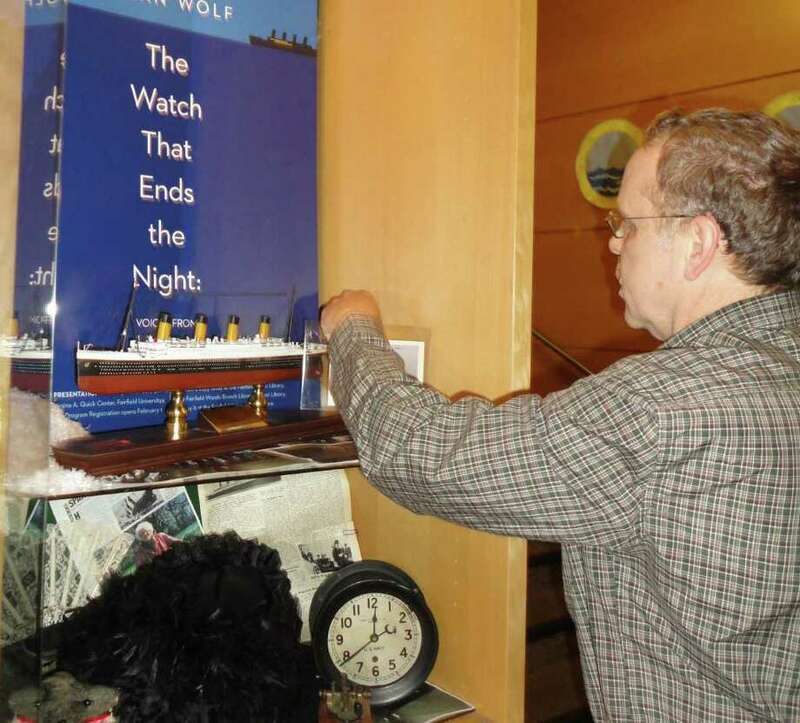 With the approach of the Titanic disaster's 100th anniversary on April 14 and 15, organizers selected as this year's book, "The Watch That Ends the Night: Voices from the Titanic" by Allan Wolf, a novel that showcases the voices of the iceberg, passengers and even the ship's rats. "Having accounts from relatives and friends puts a human face on the story. It's not just the book but the relationships and stories that come out of the book that are important," said Dawn LaValle, assistant director of the library. Santalesa said he would have asked his grandfather many more probing questions when he was a seventh-grader interviewing him for a class project had he realized he was capturing history. Santalesa said the Carpathia plucked about 700 people from the lifeboats. His grandfather said they were freezing and so the crew rolled them around on the deck to get their circulation going. Morris said his great uncle, Byles, was bound for America on the Titanic to officiate at the wedding of his brother William, Morris' grandfather. He had purchased a second-class ticket for $26. His familial connection to the tragedy escaped Morris as a teenager. What awakened his interest was a letter in an aunt's possession that Byles wrote on Titanic letterhead dated April 10, 1912, and sent to his housekeeper when they docked in Ireland. "Everything so far has gone well except that I have somehow managed to lose my umbrella," Byles wrote. According to Morris, the letter is no longer in the family's possession. His aunt sold it for $15,000 and it was later sold by that owner for $75,000. From a surviving passenger's accounts, Morris said they learned Byles was walking the deck when the Titanic struck the iceberg. The woman said he was "a strong presence of calm," and that he gathered people together, recited the Rosary and led them in the Lord's Prayer. "He didn't save people but he certainly made them calm before they died," said Morris, who also showed a copy of a painting of Byles on the Titanic created by a survivor. "It was very interesting about Father Byles. In my mind, the priest who prayed with everybody in the (James Cameron) movie Titanic is Father Byles. I'm going to think of him that way," said Mary Ellen Gachi of Bridgeport, a member of the Titanic Historic Society in Massachusetts. She toured with the society to England in 1995 where she met Dean and another survivor, Louise LaRoche, and then to France where she met another survivor, Michel Navratil. Clarkson said he asked Dean if she planned to see Cameron's Academy Award-winning film, "Titanic," but she told him, "No, I don't like the ending." "I would have liked to have sailed on it all the way to New York, but not have sunk with it," said Jerry Demner of Fairfield. Author Allan Wolf will talk about his book, "The Watch That Ends the Night: Voices from the Titanic" at 7 p.m. Monday, March 26, at the Quick Center for the Arts on the campus of Fairfield University.